Seeking solitude and seclusion, Irish monks in the seventh Century happened upon Iceland by chance, but fled two centuries later as Vikings from Sweden and Norway stumbled upon the island. After that, Norse settlers from Sweden and Norway soon began dotting the country with homesteads, having fled political strife on the Scandinavian mainland. From that time onward, Iceland’s decidedly Nordic culture has featured an economy based on subsistence farming for the most part, with a cuisine rooted in Scandinavian foods as well as a distinctly Icelandic cuisine. Well into the 20th Century, Iceland remained a poor hinterland. Subsistence farming had to deal with sparse soil, harsh weather and a short, three-month summer growing season, permitting rather limited production of just a few crops, all of which would last well into the long, cold months ahead. Accordingly, traditional Icelandic dishes manifested a “waste-not” frugality, with every part of a creature eaten, even rams’ testicles, sheeps’ heads and innards and fish stomachs. Preservation techniques included drying, salting, smoking, pickling and fermentation. Originally, fish was stored in salt obtained by boiling sea water, but, as a shortage of firewood grew, salt-making gradually disappeared in the 14th Century. Consequently, the practice of preserving in “fermented” whey that significantly altered the taste of fish and meat, took hold. That did not prove conducive to the once-valuable export market of fish. On the other hand, the practice of curing herring, skate and shark by fermentation is still in use, and fermented eggs remain a rare regional delicacy. Fermented shark (hakarl), a culinary tradition of early settlers in the ninth Century, ranks among Iceland’s top 10 foods today. While local shark meat eaten fresh is considered poisonous, Vikings found that burying it underground for at least three months induced their version of a fermentation — not a “rotting” — process that broke down the toxins and got rid of the acid. After allowing it to wind dry, the fermented shark flesh then became edible but chewy, acidic and tearfully pungent. 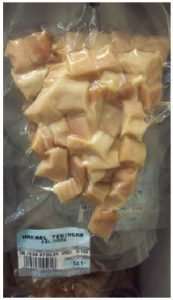 The flavour of hakarl is an acquired taste, referred to as umami, which is much appreciated by connoisseurs of very strong cheese. As for the “aroma,” skeptical foreigners refer to it as a cross between ammonia and road kill. With widespread subsistence farming, goat, sheep and cow’s milk cheese had always been a part of Icelanders’ diet until the predominance of a soft yogurt-like cheese, skyr, another one of today’s top 10 favourite foods, resulted in the disappearance of artisanal cheese-making, except in mountain cabins, where lambs were taken away from their mothers while they were milked. Originally a culinary tradition from Norway, skyr has lived on in Iceland and has recently begun making appearances in European and North American supermarkets. Eventually, in the 20th Century, industrial cheese-making began. When settlers first arrived, the climate of Iceland was milder, enabling the cultivation of barley and oats that were used to make porridge and beer. Cattle were the principal farm animals, but pigs, sheep, goats, poultry and horses were also raised. These settlers lived in long houses where holes dug in the floor functioned as earth ovens. Baking bread and cooking meat involved lowering the food into the hole and covering the hole securely for the duration of the cooking time. Then, several historical phenomena followed, significantly impacting the development of Iceland’s cuisine and food culture. While the conversion to Christianity in AD 1000 introduced fasting and banned the consumption of horse meat, the onset of the Little Ice Age in the 14th Century resulted in serious consequences for farming and, therefore, food production. A cooling climate made it impossible to grow barley, leaving the population scrambling for any type of imported cereal. Sheep became the dominant livestock, not the more expensive cattle. Heating spacious long houses proved impractical and they were replaced by Icelandic turf houses featuring smaller rooms and a kitchen with a raised stone hearth, known as a hlooir, with cast-iron pots suspended on hooks above the fire. Boiling, roasting and baking were all done in these pots because ovens, which required abundant amounts of wood to heat, were rare. For centuries, farming methods basically remained unchanged. Fishing with a hook and line in freshwater streams and rivers was done from rowboats made from driftwood. Because farmers owned the boats, fishing, which was considered a risky distraction, failed to take priority in the subsistence farming culture. Nevertheless, fish was part of Icelanders’ diet and could be exchanged for imported foreign products such as rye, oats and corn. Ground corn, supplemented with lichens and dried dulse and boiled in milk, produced a thin porridge, which, in turn, was often combined with skyr to produce a dish called skyrhroeringur. Corn ground into flour allowed Icelanders to make a variety of breads that ordinary people regarded as a luxury. Dried fish with butter, present at every meal, served the same purpose as bread. The most common type of bread was (and remains) pot bread known as rugbrauo, a dense, dark, sweet rye bread that Icelanders also baked by placing the dough in wooden casks and burying it in the ground adjacent to a hot spring. When retrieved the next day, the bread had acquired a slightly sulphuric taste. Cooking eggs and small game, as well as some baking in hot springs, continues to be a unique aspect of Icelandic cuisine. The Napoleonic Wars (1803–1815) resulted in a shortfall of supplies when merchant ships ceased coming. This encouraged Icelanders to produce their own vegetables — a tradition brought from Denmark — particularly hardy varieties such as potatoes, turnips and cabbage, which soon became standard accompaniments to meat and fish. When a ban on Danes settling in Iceland lifted in 1770, several other Danish culinary traditions began to emerge. By the 19th Century, fishing villages were established and thriving. “However, the real fishing industry started with the introduction of the steam engine in the early 20th Century,” Ambassador Sigurjónsson said. This provided inexpensive fresh fish that became a staple in Icelanders’ diets, with haddock, plaice, halibut, herring and shrimp being most widely consumed. A booming modern economy in the 20th Century, based on the export of seafood, resulted in a dramatic shift in culinary traditions with a focus on fresh foods rather than preserved foods. Cheese-making re-emerged and featured popular European varieties such as gouda, camembert and blue cheese, while product development of other dairy products such as whey-based beverages has also driven up the popularity of skyr. Danish pastry-making had an enormous influence, a culinary area in which Iceland had few traditions. These have even outlived those in Denmark. Smoked lamb, called hangikjot, remains a traditional Christmas delicacy, although Icelanders also enjoy it all year. The procedure involves smoking lamb or mutton with birch or dried sheep dung, then boiling it and serving it hot or cold with potatoes cooked in a white cream sauce, green peas and red cabbage. 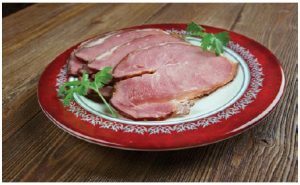 In recent years, twice-smoked lamb, which is eaten raw in the same way as prosciutto in Italy, has become a culinary favourite, particularly as a topping on laufabraud, a thin, circular, deep-fried cracker-type bread. Although sausages, in general, have lost much of their appeal, an iconic Icelandic food, pylsur or hot dog, made with lamb as well as beef and pork bits, offers a wonderful depth of flavour boosted by the lamb, even when smothered by a profusion of highly recommended condiments. Rams’ testicles are not a common item today, unlike sheep’s head, which is available in some grocery stores pre-cooked or frozen. Diners eat the entire head, which has been singed to remove any remaining wool, and debrained, before cooking. Nothing is left untouched, including the tongue, eyeballs and ears. The tongue and cheek are reportedly the best parts. A regular accompaniment to sheep’s head is blood pudding, known as slatur, which literally means slaughter. Made from sheep’s innards, blood and fat, there are two sorts — bloomor (blood pudding similar to English black pudding) and lifrarpylsa (resembling a smoother-textured Scottish haggis). At one time, some people opted to sprinkle slatur with sugar before eating it, while many gatherings offered slatur along with rice pudding. Icelanders also eat beef that is well marbled due to the cold climate; horse, which is usually salted and served boiled, or as a smoked sausage known as bjung; and free-range reindeer, which were introduced in the late 18th Century. Usually reserved for Christmas, reindeer has a unique taste and is considered a very expensive delicacy. Small game primarily includes seabirds such as puffins, cormorants and great black-backed gulls as well as waterfowl, including mallard ducks and geese. The high content of fish oil in the flesh of these birds requires the meat to be soaked in milk overnight to extract the oil prior to cooking. Puffins boiled in milk sauce or smoked are another Icelandic delicacy. Ptarmigan, a plump, partridge-like bird served as a main course with a creamy sauce and jam, represents another Christmas tradition. Icelanders also enjoy wild salmon, generally smoked or marinated with herbs, and sweet langoustine lobsters, a favourite of the ambassador. Abundant quantities of fish are consumed cooked fresh and in soups or as the age-old hardafiskur, which is hard, chewy, fiercely fishy-smelling, wind-dried haddock or cod. Often referred to as fish jerky, Icelanders and foreigners devour tons of it each year, frequently in the traditional manner — spread with butter or as thin chips, crunchy brittle chunks or soft, feathery ribbons. Saltfishur, gellur (the fleshy triangular muscle under cod tongues) and minke whale have always been part of Icelandic culinary traditions, whereas seal meat has lost its appeal. Fresh fruits and vegetables only made a serious appearance in Icelandic cuisine during the last few decades, replacing canned varieties. Greenhouses, powered by geothermic energy, provide fresh vegetables and fruits, but almost any type of sweet fruit except berries must be imported. As for desserts, Icelanders enjoy several traditional types: twisted donuts known as kleinur; piparkokur, a type of ginger Christmas cookie frequently adorned with a coloured glaze; snudur, a cinnamon roll with a glaze or melted chocolate topping; skuffukaka, a one-layer cake baked in a roasting pan, enveloped in a chocolate glaze with a sprinkling of shredded coconut; a variety of multi-layered cakes; rice pudding with raisins; skyr topped with honey; pancakes; kransakaya, an almond-flavoured cone-shaped wedding cake filled with chocolates and candy; plus a variety of delicious licorice, including many types coated with chocolate. Over the years, modern chefs have become increasingly more creative, placing greater emphasis on the availability of quality local ingredients while designing innovative world-class dishes as well as giving a gourmet twist to traditional dishes. But for a truly original Icelandic cuisine experience, there’s the Viking midwinter festival, known as Borrablot. 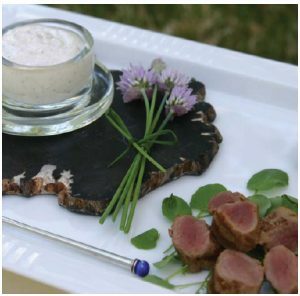 I welcome you to try my appetizer version of Barbecued Baby Lamb Tenderloins with Skyr Sauce. Bon Appétit! Verdi ykkur ad godu! 1. To make the sauce, whisk together skyr, sour cream, honey, vinegar, nutmeg and salt. (Makes about 3/4 cup or 180 mL.) Place in an airtight plastic container and refrigerate for up to 3 days. 2. Remove the silver skin from the lamb tenderloins. Whisk together mustard and olive oil before smearing it evenly and completely over the tenderloins. Just before grilling, sprinkle tenderloins with salt and crushed black peppercorns. 4. Transfer grilled tenderloins to the plate, cover with aluminum foil for a few minutes, allowing juices to settle. Cut into 2/3-inch or 1.5 cm-wide pieces. 5. For 4 individual servings, arrange 1/4 of the lamb pieces on 4 individual plates along with 1/4 of the Skyr Sauce and, if desired, butter-glazed, cooked mini potatoes. Garnish with fresh herbs or watercress. * Option: Regular lamb tenderloins cut lengthwise in thirds. ** Option: Skyr is widely available in Canadian supermarkets, but if you can’t find it, use Greek yogurt. Bravo Margaret Dickenson- Professional Home Economist! Great article!